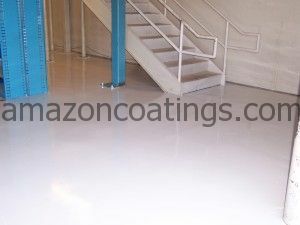 Here at Amazon Coatings, we apply both Residential and Commercial Floor Coating Systems. Unlike many floor coating companies, we prefer the smaller, commercial projects. We have applied Epoxy, Polyurethane and Fast Drying Polyaspartic Coatings throughout the East Valley. You will find our coatings in Auto Dealerships, Auto Repair Facilities and Airline Hangers. You’ll also find our coatings in Warehouses, Storefronts and Locker Rooms. 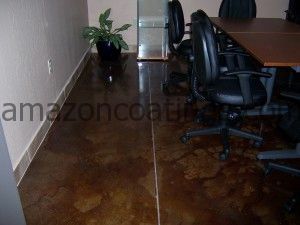 Our coatings are in conference rooms, offices, hallways and kitchens….. The key is to match the products to the intended use of the area. Is a Fast Cure System needed for the project? Do you need a floor with heavy non-skid for areas that seem to always be wet? Or does your floor need to stand up to the use of fork lifts? Did you know that a light colored floor will not only brighten the area, but provide reflective lighting in poorly lit areas? Maybe you just need to “dust proof” your floor to make it easier to clean…. We can help with that too! If you’ve got questions, we’ll do our best to get you answers. Not everyone needs a bright, shiny floor!